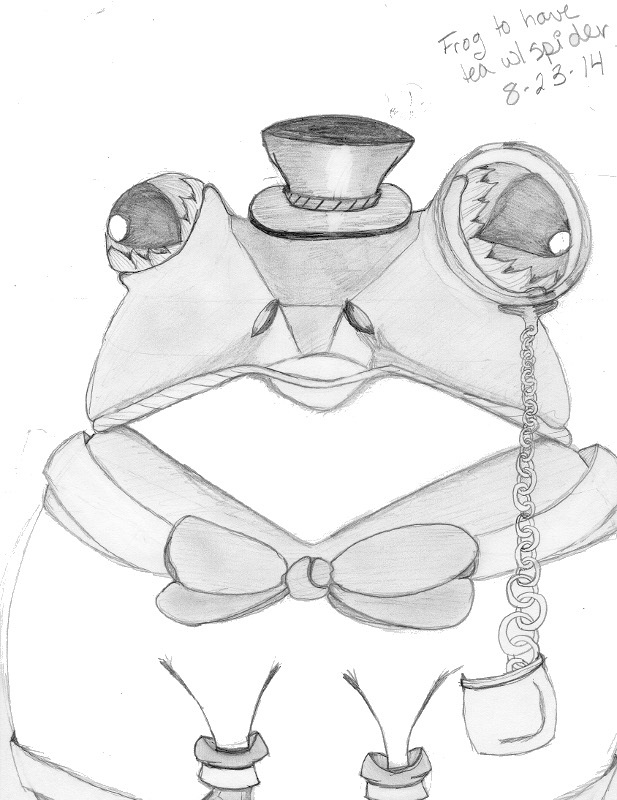 Alright, I can’t seem to find the materials I need to outline my froggy character, so I’m just going to share my pencil sketch of him. I apologize if areas of him don’t show up so well. I wrote a short story last month and I decided to actually “finish” it. Of course, to do that I have a lot of things to start. First and foremost: character designs. I’m sketching out the simple characters involved in the story. Fortunately, there are only two characters. Yup, two: a frog and a spider. Sound like fun? Keep reading. The frog turned out pretty good, I thought. There are a few things I need to tweak, but I am really happy with it. I still need to outline it, so I can’t share that with you just yet. Instead, I am going to show you the spider. This was the first draft and isn’t something that I’m happy with. Still, I learned a lot from it. I haven’t colored it or anything. I simply scanned it in, so excuse the simplicity. I did not intend for her to turn into an older spider lady, but it just kind of happened. 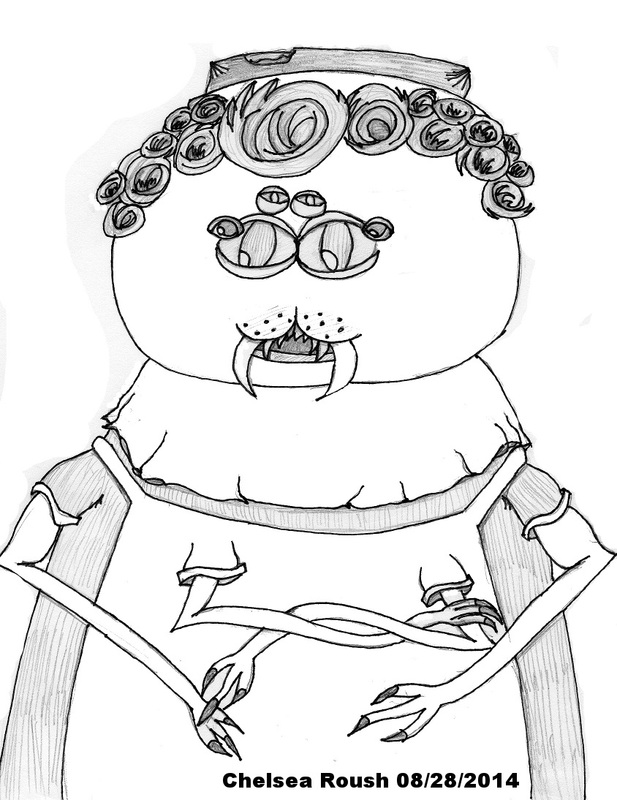 I will attempt to make the next version a little more like the Evil Stepmother from Disney’s Cinderella. She will have a heart shaped head and face with the larger eyes at the top and the three smaller eyes in the middle. We’ll see how it works out. Hubby and I love to play MMORPGs (that’s Massively Multiplayer Online Role Playing Games). We have tried several in the past (DDO, Allods Online, Runes of Magic, Runescape, World of Warcraft, Global Agenda, etc.). Our recent exploits into the MMO world have led us to the Lord of the Rings Online (LOTRO) game. It is free to play (although if you pay a VIP montly script you get bonuses), and the world is vast. We particularly enjoy the way the characters gain multiple abilities as they level, leaving the player the decision of how to play that specific class. At any rate, we have been playing a lot of this game as of late due to Hubby’s sparse hours and my current lack of a job. Therefor, it has been on my mind a lot. I created a specific character “Braghan BrownWitch” (that’s “gh” as in “F”) and decided to use her in one of my latest shorts. I hope you enjoy it! BrownWitch sat on the dock, her toes just skimming the warm water of the lake. Her wooden Yew pole in both hands and a bobbin on the end of the pole just, well, bobbing. It hadn’t moved in ages. BW sighed and straightened her pointed, floppy hat. The sunshine was bright and hot today, she was thankful to have her usual companions about: floppy hat, leather bladder of cool water, and a warm breeze. The cotton fabric of her brownish robe rippled in the breeze and she smiled at fond childhood memories spent in sundresses on days just like this one. Her pleasant reverie, however, was interrupted by something in the woods far ahead. BW couldn’t make it out at first. A bear? A large boar perhaps? She squinted and murmured a seeking spell under her breath. BrownWitch was not one to misuse her magick by any means, but it was sometimes necessary to err on the side of caution. The seeking spell could be used for several purposes and had different outcomes, but this time she was using it to try and see a creature just beyond her own sight. This would allow her to see, in her mind’s eye, the very creature she could not see with her physical eye. She stopped paying attention to her bobbing fishing line and began to take stock of magickal items. She had protection charms on one wrist, one finger, and her necklace. Defensive magickal charms were on her other wrist and finger. Her earrings held enhancement charms which would allow her to further the reach of spells or increase their intensity. Her staff lay next to her, resting on the dock in the hot sun. Even her robe itself was laced with the fabrics of the Elves and blessed by none other than their head Scholar. She was well protected against such enemies.. as long as too many did not appear. What appeared in BrownWitch’s mind’s eye was a simple Goblin. A greenish brown figure, hunched over and holding a spear in one hand and a shield in the other. She was thankful to be such a distance from the thing as she was sure more were near. Lots of Goblins meant lots of stink and rot. She was not in the mood for such smells as she worked to catch her lunch. Many people mistook the greenish brown coloring for the actual creature’s color. It wasn’t. Naturally, Goblins were grey. The green-brown sheen they carried on their skin was a thin slime of bacteria that slowly coated everything they came into contact with: weapons, clothing, tents; even the land would become infested. Farmers hated seeing the lone Goblin slithering through the woods because it meant many more were nearby, and it meant their slimy filth would slowly rot the land. BW had seen it happen many times. Whole potato crops would turn black and festered. Corn crops would turn to a brown slime, stinking of death. It wasn’t that the Goblins themselves had come into contact with the crops. Rather, they had been on the land. Their slimy filth had infected the soil itself. For years later, anything grown on the land would fester and rot. Eventually, the buildings would succumb to the rotten slime and begin to cave in. Even people would die if they stayed too long around such filth. BW shivered. It did not matter to the Goblins that all the crops were turned to rot. They didn’t eat vegetables. This thought always brought a chill to her spine. She always took for granted what the pig on the chopping block must have felt like until meeting Goblins for the first time. Now, she was that pig. She did not let on that she saw the creature, it did not seem to see her or, at least, was not interested. She kept her physical eye on the bobbing line and her mind’s eye on the creature. She silently put up a magickal barrier in case any others were around. Goblins could surround you in an instant. Their green-brown muck was the perfect camouflage. Worse yet, Goblins often had other creatures with them: Orcs, Undead, even human Necromancers or Warlocks had been known to take company with such vile creatures. The thought of feeling out for any magickal beings crossed BrownWitch’s mind, but she quickly thought twice. Anything worth detecting would probably detect her probing. It would cause any such creature to become aware of her, and focus intense offensive magick her way. Although she had dealt with many such creatures in the past (Undead Sorcerers, Necromancers, and vile Spirits to name a few). She was in no mood to get into a magickal dispute with vile creatures on a fine day such as this one. BW sighed and her hands yanked. She instinctively snapped the pole back and began to reel in the fish. She slowly pulled the flapping, glistening fish out of the water. Trout! A lovely, large Trout. What a fine meal for such a fine day. She was all smiles, and then she turned back to the wooded clearing. The Goblin was gone. She used her seeking spell and found absolutely nothing. It could have gone back into the woods, but so quickly? BW quickly packed her fish away and headed away from the shore. Before the Goblin arrived, she would have only been on the lookout for a good spot to start a small fire and cook her lunch. Now, however, she was looking out for Goblins as well. She found a nice place. There was a small path from the road and then a rounded part of dirt. There was even a mound of sand where someone else had been using this place to cook fires. She stared at it. It was pleasant, and obvious. She looked around for any hiding places. The rounded dirt area seemed to be cut out of a small area of a hill, leaving it surrounded by higher ground. It would be easy to be taken by surprise in such a place as this. She kept walking, and looking. She was about to give up hope when she found another rounded dirt area, only this one was less conspicuous. The area was surrounded by brush that would have to be picked out, but it would make good tinder. She set her bag down and began to pick the dried brush out of the soil. It came loose with ease, the hot summer had fried a lot of the underbrush along the roads. They were browned already, so no green would be left in it to prohibit the heat of a fire. She was make an intricate pile in the center of the dirt round she had made when she heard it. It was rustling along the dried out brush. Someone or something was approaching her position, and not using the road. She slowly reached for her staff and charged her protective charms, inciting incantations under her breath. She could hear the sound getting louder, but could not determine exactly from where it was coming. She looked around with her physical eye and began to reach out with her mind’s eye. She wasn’t getting anything. That was never a good sign. Her fingers reached her staff just as the figure broke through the brush. She swung the point of staff around and began to loudly cite an incantation. The wind swirled around her and picked up the dust and loose brush. It looked as if she were inside a strong dust devil. Almost immediately, she recognized the figure. She heaved a sigh of relief as her staff’s point fell Earthwards. She smiled and shook her head at the wolf that appeared. It looked scared half out of its wits. It’s fur was silver, with an otherworldly glow. His wide eyes glowed a robust orange and his fangs were showing out of a sense of instinct. As soon as BrownWitch dropped the point of her staff, the wind died down. The wolf gave a smile of his own and returned her laugh. “I thought you were going to blast me to the Heavens,” said the furry canine as he walked into the middle of the circle. He sat on his haunches and looked at BrownWitch. He was as tall as she was when he was sitting and came to about her chin when he stood on all fours. BW reached out and scritched the giant wolf under his furry chin. He closed his eyes in contentment, laid his ears back, and wagged his firey tail. “It’s a good thing I didn’t try to,” BW said, “a scorch mark on the ground would have all that remained of me.” She patted the wolf on the head as she finished her sentence and he opened his eyes just in time to see her wink at him. He stood on all fours and began to sniff the air. “Goblins?” asked BW. “No, fish,” said the wolf as he walked over to her satchel and began nuzzling the flap. She quickly walked over and picked up her bag. “Was it Goblins you were so afraid of, BrownWitch?” asked the wolf, one ear cocked. BW sighed. “Not just Goblins,” she said as she began to pick up the scattered brush twigs, “something.. else as well.” The wolf looked at her a bit, furrowed his brow, and then shook his massive head. “I’ve never known you to be afraid of those things,” he continued as he followed her around, sniffing the satchel. “I’ve seen you dispatch far worse creatures than simple Goblins.” He nipped at the bag and BW grabbed his muzzle. She carefully brought his nose up to hers and shook her head. “Not just Goblins,” she repeated, “something.. else as well. Something unseen.” She released her friend’s nose and started working on the fire. He flopped on the dirt and began scratching an ear. “Unseen?” he asked. He looked up at her. “Why did you not just use your seeking magick?” “I did, in order to see the Goblin.. But.” She thought of the feeling she had when she noticed the Goblin to begin with. An overwhelming sense of intense danger. Never would a single Goblin instill that kind of reaction. It was true, Goblins could surround you in an instant and they did tend to hang out with some abject characters. Still, there was a sense of something else there. Something that did not want to be known. She could not explain this to her friend. “That fish smells delicious,” the wolf went on, as if there was never any talk of Goblins, “I suppose you would share with your dearest friend?” He looked at her with larger, glistening eyes but his tongue kept licking his teeth and this made BrownWitch laugh. “I suppose I would,” she countered. “If you happen to see them, let me know.” She winked again at the animal. “Truly!” he exclaimed, half-heartedly. “If you have better company to be keeping..” He stood up, smoking tail between his legs. He looked back at her with those large eyes again. BW laughed and fished the Giant Trout out of her bag. “Well, I suppose this fish is much too large for my stomach alone.” The wolf immediately turned around, ears pointed, and re-lit tail wagging. He started licking his teeth again. BW started the fire and began setting up the rocks to cook the fish. “Cooked? !” The wolf jumped. “You’re going to cook it? !” He looked at her as if she had gone insane. BW looked at the fish and then back at her furry friend. “Of course,” she said, “how else would one eat a fish?” “Whole of course!” replied the wolf. BW smiled. Spending time with Wolfe was always a pleasure. “I’ll tell you what,” she said as she drew a dagger from her waist, “I’ll cut it in half, straight down the middle. Your half can be.. whole. My half will be cooked.” Wolf mulled this over a little bit and then nodded, “What a smart human you are, BrownWitch,” he said, half condescendingly. BW just smirked and filleted the fish in half. She tossed half of it over to Wolf, who simply swallowed half the Giant Trout, whole. He laid down, head on his front paws and watched BW ruin the other half of the fish. After her half had cooked, she began to eat amid some peculiar sounds. “Truly?” BW asked her friend, “You want more? And some that is cooked? Do they starve you on the Astral Plane?” She said this last bit right before shovelling more fish into her mouth. Her friend scoffed. “I merely think that such a beautiful lady such as yourself does not need quite as a big a fish to sustain her wonderful figure.” He looked up at her, ear cocked, hopeful. BW shook her head and kept chewing. Wolfe sighed and put his head back on his front paws. He had just drifted off to a wonderful sleep that involved dancing Giant Trout when he heard the sound. He was immediately on all fours, back arched and alight with an otherworldly fire. His eyes were glowing deep orange and smoke was coming from his mouth. He looked around and did not see BW. Her bag was still there as well as was her staff. There was no way she would dare go anywhere without her staff. He made a quick magickal scan of the area, but didn’t come up with anything. Still, something was off. All of his senses were telling him there was something very near, something dangerous and vile could have been standing right next to him.. but he saw, smelt.. felt nothing. He slowly began to walk around the circle. He went in one direction only, moving very slowly and sniffing the ground. He immediately launched a stream of fire from his mouth moved in the circle he had just walked. “Blasted fool!” The vile creature jumped and released BW. It had been hidden, standing there the whole time. Wolf ran over to the unconcious witch and stood guard over her. He growled at the thing standing in front of him, brimstone dripping from his fangs. The creature had to be Undead, or at least as close as the living could come to it. It looked like a Zombie, only it’s flesh wasn’t rotting.. it was throbbing. Upon further inspection, Wolf began to see that the creature was made up of various body parts from other bodies. “Great,” growled the furry ball of fire, “another Necromancer. Will you things never learn?” The Necromancer was still trying to put out the Astral Fire that Wolf had breathed upon it. It would fail. Only one thing could put out that fire and that was the water of the Elves. The creature kept cursing and moving about. Finally, he turned to Wolf and scowled, “I will exact my revenge you fool.” He disappeared in a puff of putrid smoke. Wolf looked down at BW and began smelling about. He was looking for what kind of magickal spell was holding her. He got his answer when his nose came upon her bloodied scalp. He immediately began to lick her cheek. “BrownWitch, wake up!” He stopped on her cheek and began to wander around the brush, looking for healing herbs. BW groaned and began to move a little. “Stay down, BW,” Wolf said, “your head has been inured.” He came back with a mouthful of herbs and dropped them on her. She groaned again and reached for the herbs. “They’re all dried up, Wolf,” she said, “they’re no good.” She slowly stood up and put on her hat. Wolf nuzzled her shoulder. “I’m alright, old friend,” she said, “but would you mind walking a beautiful young lady with a wonderful figure to the nearest town?” She winked at Wolf and he immediately felt better. He picked up her satchel in his mouth. BW grabbed her staff and the back hairs on Wolf to steady herself. Slowly, very slowly, they began walking the road Southwards. “What on Earth was he after,” BW asked aloud, to no one in particular. “He was a Necromancer,” said Wolf, “he was after you magick. He needed it to keep himself.. together, for lack of a better word.” Wolf looked up at his wobbly friend. He was worried. That knock on the head must be worse than he thought. She should have immediately known what was going on.. His words were interrupted by a welcome sight on the horizon; a cabin with healthy crops out back and smoke coming out of the chimney. At least no Goblins were near and no Goblins meant no Necromancer. The thing would be tricky though, how to get people to help BW without freaking out about the giant, fire wolf. Wolf was just trying to figure this out when BrownWitch fell on the dirt road. “BrownWitch!” he yelled, a little too loudly. The people in the cabin poked their heads out the door, bow and arrow in hand. 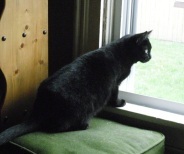 “Who goes there? !” yelled a man. Wolf darted into the high brush weeds and flattened himself as low as he could. The cabin man yelled a few times more and knocked his arrow. He was prepared for a fight. Wolf hoped he was the helpful kind. The man slowly walked down the road, towards BW. “You there!” he yelled, “Stand up, I say!” He stood for a time, arrow pointed at BW. Wolf almost leapt at him a few times, to prevent him from shooting, but his hope for BW to get help was greater than his fears. The man slowly shuffled towards BW. He looked about him constantly, but slowly put his bow and arrow down. He drew a dagger from his waist and said, “I’m fully armed and not afraid to kill you if I have to!” He walked closer to BW’s mound of a body and nudged her with his foot. He immediately jumped back, but BW didn’t move. The man stood there a while, mulling the situation over. A strong breeze blew and BW’s hat flew off down the road. Her bloodied scalp was painfully obvious and the man dropped his bow. He ran towards BW’s body and put his hand on her hair. He drew back a blood-stained hand. “Great Gods!” He lifted BrownWitch off the dusted road and turned back towards his cabin. Wolf sighed pure relief, but when he looked back at the road the man was standing there.. staring into the brush weeds. Did the man see Wolf? Were the Goblins or Necromancer back? Wolf thought of reaching out with his mind’s eye but knew this would attract the Necromancer once more. The man took a step towards Wolf but seemed to think twice of it and turned back towards the cabin. Wolf watched him go inside and then sat outside the cabin, near the chimney. He could put some of his healing energies into the fire of the cabin. He fell asleep inciting incantations for stopping internal bleeding. When he awoke, the man was standing in front of him. Wolf hadn’t sensed him at all. He slowly sat up and waited for the man to act. The man just shook his head and then turned to walk away. Wolf took a step forward and asked him, “Is BrownWitch alright?” The man kept walking. “I’m talking to you, sir,” Wolf insisted. The man turned and smiled. “Come inside, old soul,” he said, “you should have shown yourself from the brush last night.” Wolf’s jaw fell open. So he did see him. Who was this man? Wolf followed the man into the modest cabin. “Your friend, ‘BrownWitch’, you may call her, is in the back room and is resting.” The man pointed and Wolf nodded his furry head. He almost ran to the back room to see BW on the overstuffed bed, snoring soundly. “Phew!” he thought, “at least she’s alive.” He turned around and saw the man standing in the doorway. “You knew I was outside, then?” “Yes,” answered the man, “I should have known a witch and Astral Wolf were involved in the magickal goings on around here recently.” He chuckled to himself. “Goings on?” asked Wolf. “Have you seen Goblins.. or.. something else?” “My dear Wolf,” said the man, “I”ve seen many things in my time as well as several Goblins and a stray Necromancer or two.” He looked at Wolf for a few minutes. “I assume you meant the Necromancer? The current one, at any rate.” The man walked out of the room and headed towards the fire of the main room. “It seems every few decades a different soul takes a crack an Undead Immortality.” The man sat in a rocking chair and began smoking Pipeweed. Wolf had followed him and now stood on the other side of the fireplace, sniffing the aromatic smell of the Pipeweed. “Who are you?” Wolf finally asked. “They used to call me The Overseer,” replied the man, “nowadays, no one calls me much of anything.” He put his pipe back into his mouth and started to rock his chair a little. “Hmm, never heard of you,” Wolf said as he laid down with his head on his paws. The man smirked. “That’s probably a good thing, fluff-o-fire.” He closed his eyes and started humming a tune only he knew. Wolf raised his head and looked up at the man, deciding whether or not to begin questioning a complete stranger about their past. A past they had obviously put behind him. He sighed and put his head back on his paws. It would have to wait, for later. They both sat in front of the fire, waiting for BrownWitch to awaken. For the past several months, I’ve been working on writing short stories on my blog (this one) and writing longer stories that I hope to publish via ebook formatting. I have been busy reading Smashwords.com style guides, marketing guides, etc. (Smashwords.com is a great site to self-publish a book. You have to take a few extra steps to ensure your book is properly formatted for the ebook experience, but the work is well worth it.) I have also been reading up on copyright issues and all that legal jazz. What I have found has disturbed me. Apparently, there are individuals and actual companies that take advantage of the various forms of “free” content on the Internet. They will actually scam some people into purchasing a database to this content where they can Frankenstein a book together and try to sell it on a site such as Smashwords. I am not condoning this behavior, I am appaled by it. If anyone tries to do this, they do end up being banned from self-publishing sites with any self worth. For more information on this, visit WriterBeware! That is just one aspect of writing my book. I had planned on keeping up a blog that was purely short stories as a sort of advertisement for the longer stories that I would write. Now, I am unsure if this is a good idea or not. I try to put a © symbol at the end of each story so that people are aware the content is not “up for grabs”, but I still worry. I do not like the idea of Creative Commons Licensing because it would allow distribution that I would be unaware of. Don’t get me wrong, I don’t think that my stories are so great and wonderful that someone is just waiting to find a way to make money off of them. I know that people are trying to make money off of every small piece of drivel they come across. Thus, my worry. Last of all, procrastination. Ah, my dear friend, we meet again. Did we ever truly part? I am currently experiencing procrastination on a level that is far different than anything in the recent past. Unemployment and poor health have lead to a sort of Depressive procrastination where one does not think, “I can do it tomorrow.” Rather, one thinks, “…” Yes, the space filling the gap between my ears has gone more quiet than is good for someone wanting to begin a career that involves any form of thinking. I wonder if perhaps I have chosen a bad time? But then, isn’t everytime a bad time? I suppose that leads us to a summary. I guess the monsters to creativity are greed (from both myself and others), worry, and procrastination. I can see them all dancing gleefully about in what is left of my brain, making sure to trounce on the last remaining braincells. Only then would they truly be successful in their endeavors. To the monster’s ball!